Korean heart-throb Lee Min Ho is back on the big screen with Bounty Hunters 赏金猎人. For fans who have all awaiting for his high-kicks and swift punches since Gangnam Blues (2015) and City Hunter (2011), the time is here. 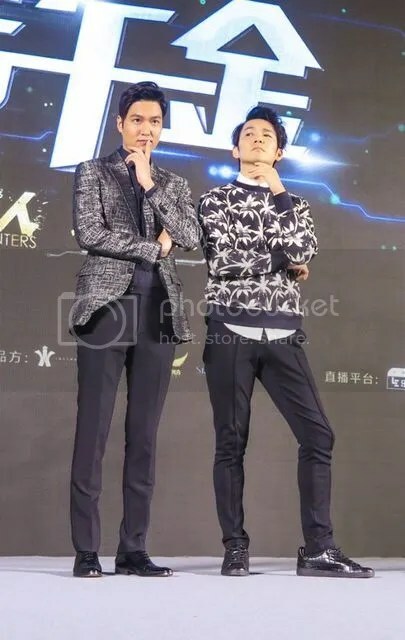 Teaming up with the beautiful Chinese actress Tiffany Tang and stylish Wallace Chung, the trio shared a great chemistry that is bound to keep you laughing throughout the movie. This was something I little expected. Honestly, the story line was plain with the usual good versus bad scenarios and foreseen ending. Just like all crime-solving movies, there is always a character with unlimited wealth to support lavish spending and highly advanced weapons. Similar to typical fugitive-chasing movies, Bounty Hunters no doubt is about tight teamwork and cool action stunts. Yet when it sounds all too unexciting, this movie caught me by surprise with countless funny moments. Indeed, the two male leads must have had a great time filming those scenes too. From jokes playing with words like “오빠” Oppa to jaw-dropping kissing scenes, the audience is constantly entertained with surprising appearances and witty stories. In particular, Wallace’s character was a complete reverse from his previous romance drama, My Sunshine; from the serious and principled lawyer to the lively and comical ex-Interpol officer. I believed that Wallace has proven himself to be a versatile actor. Perhaps this character is much closer to his true self too. Bounty Hunters is definitely a refreshing movie to catch this summer. Currently, in Asia, it has surpassed ₩3.2 billion, further strengthening Min Ho’s position and fame in the region. Be sure to catch Bounty Hunters in theaters!